Smartwatches that promise to make reading your notifications easier, fitness bands that guarantee accurate biometric readings and headsets that merge virtual reality with the actual world, wearables are inescapable. While Fitbit and smartwatches are taking the world by storm nowadays, here we give you a round-up of the newer, more advanced wearables that you must take a note of. 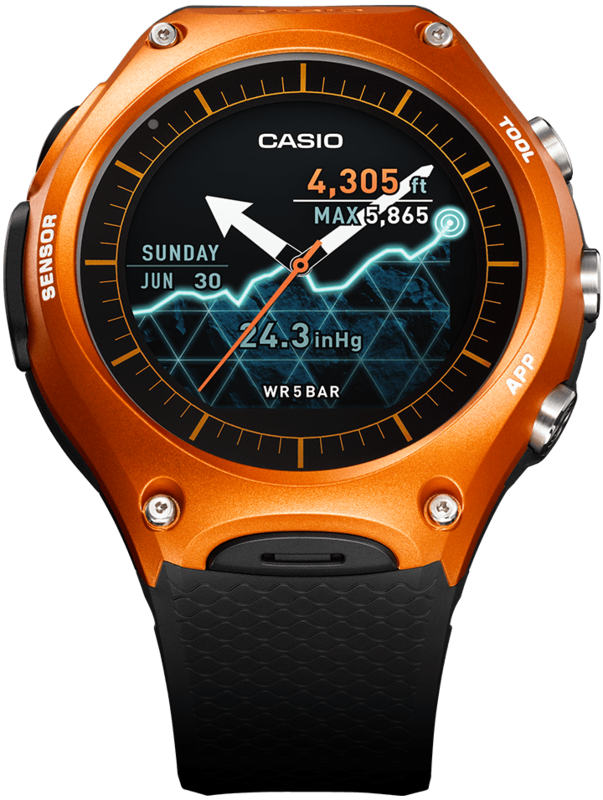 When it comes to smartwatches, nothing is more advanced than this CASIO watch. The watch has a rugged body made for the outdoorsy people and looks formal enough to take into that board meeting. The watch is water proof and shock proof by US military standards and has many pre-installed apps. You can also switch off the touch screen display to leave you with a regular watch. In this mode, you can get a battery life of up to a month! Move over Fitbit, Under Armor is the complete Health package. The HealthBox line of wearables is making a huge impact in the market. With the device being able to measure sleep, calories, heart rate, steps and even metrics for interval training, you can expect it to completely change your fitness world. Though it is not considered a value for money fitness platform, with some alteration, it can be a great competitor of fitness wearables. While most wearables are either bracelets or watches, the Bragi Dash wishes to change that by giving you all your info in your ear. This wireless earbuds work as a fitness device tracking your steps, heart rate and running, and it also acts as a multimedia device by playing songs and it lets you receive calls too. The device is amazing as it has more than 1,000 hours of playback time and tech for making phone calls too. Everything has been fitted in a small device to give you one of the best hands free experiences a wearable can. For Bragi, though, the current version of the Dash is an imperfect experiment and it seems there are miles to go for them, it is certainly a fascinating device. Hexoskin is taking sport tracking to the next level. The smart shirt has built in Bluetooth that can connect it to any third party platform or wearables. The shirt gives you readings of your heart rate, respiration and steps taken among other things. It can also measure other aspects of your workout like intensity, recovery rates, fatigue levels and sync them all to a database to be available later. The shirt is also light and comfortable to wear and more convenient than having just a dedicated chest strap. HTC has made a lighter and comfortable head gear with an inbuilt camera to integrate your virtual experience with the real world. The camera streams a view of the real world while you are having your virtual experience to nicely merge the actual and computer generated reality. With controls for haptic feedback, gesture control and a revamped virtual experience, the Vive Pre will take immersion to a whole new level. Gone are the days when you tie a thread or chain as a friendship band. Gemio is an amazing social wearable that alerts users when their friends are nearby, by flashing lights or giving vibrations. The device can communicate with other Gemio users within a 50 ft. range indoors and a 100 ft. range outdoors and uses the LEDs on the device to create different patterns and colors representing different messages. It uses Bluetooth and mesh technology and is also customizable and available in many different colors and styles with detachable gems. The wearables industry is still relatively new, and if you are in the market for one, knowing where to start can be a little daunting. We hope that this guide will help you selecting the best wearable for you! Do You Know about the New Buzz 'Internet Bots'?